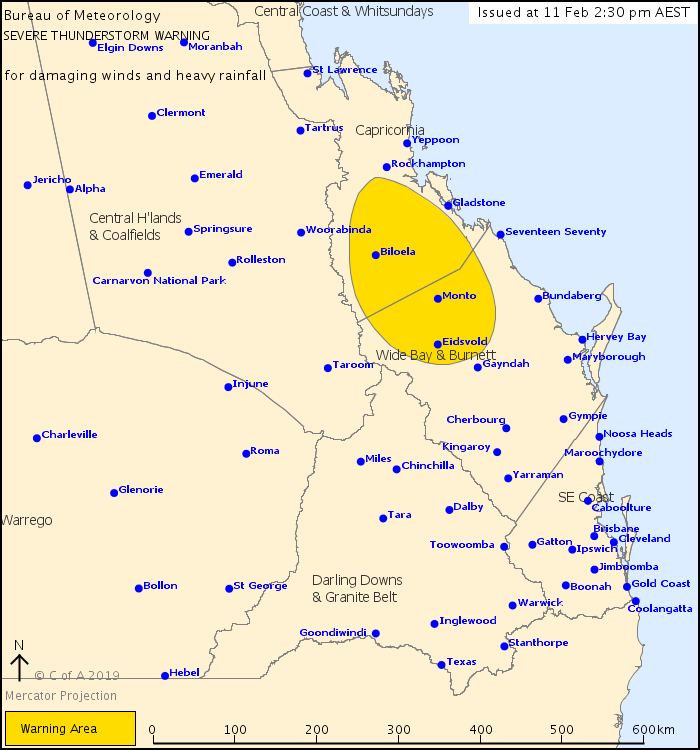 For people in parts of Capricornia and Wide Bay and Burnett Forecast Districts. Issued at 2:30 pm Monday, 11 February 2019. Weather Situation: Heavy and slow-moving thunderstorms are developing across the Capricornia, and Wide Bay and Burnett districts. They will become more extensive later this afternoon, possibly extending further inland. Severe thunderstorms are likely to produce damaging winds and heavy rainfall that may lead to flash flooding in the warning area over the next several hours. Locations which may be affected include Biloela, Monto, Eidsvold, Calliope and Mount Morgan.